I went to the gym this morning. 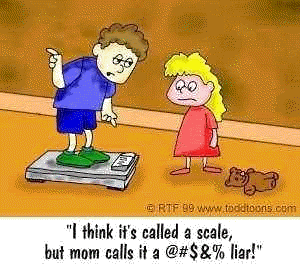 I got the personal trainer to weigh me. It wasn't good news. I thought I had a rough idea of my weight and body fat percentage from my scales at home (although admittedly I've been putting off weighing myself for the last month or so). However, the numbers on the scales at the gym were very much worse than what I'd expected. I'm putting this down to 1) I ate breakfast before going to the gym 2) I was clothed and 3) I've put on some weight over the last few weeks! But there we go. It doesn't matter about any of those things - the point is I have a starting point, and a benchmark with which to compare my progress over the coming weeks. On the plus side, I had an incredibly hard but enjoyable session in the gym of 5 minute warm up on the bike, 45 minutes of grueling circuits (burpees, press ups, crunches, dips, boxing, step jumps, and a whole host of other things), and then 10 minutes of stretching. I'm feeling absolutely "fatigued" (word of the day from my PT) but also very motivated to eat well this week, and get some lower numbers on the scale when I go back for my next session!